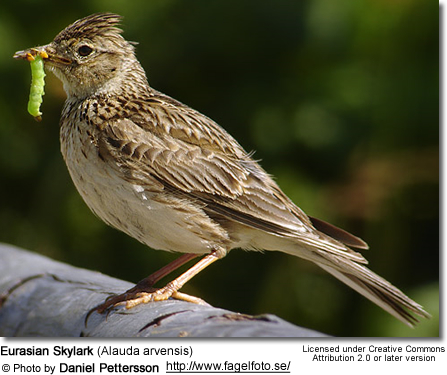 The members of the Lark family Alaudidae occur naturally in the Old World, as well as in northern and eastern Australia; with the exception of the Shore Lark, which has expanded its territory into North America, where it is commonly referred to as the Horned Lark. These small to medium-sized birds measure from 12 to 24 cm (5 to 8 inches) in length (including the tail) and weigh between 15 to 75 grams (0.5 to 2.6 ounces). Some lark species have heavy bills that are suitable for cracking seeds open, while others have long, down-curved bills, suitable for digging through litter in their search of insects. 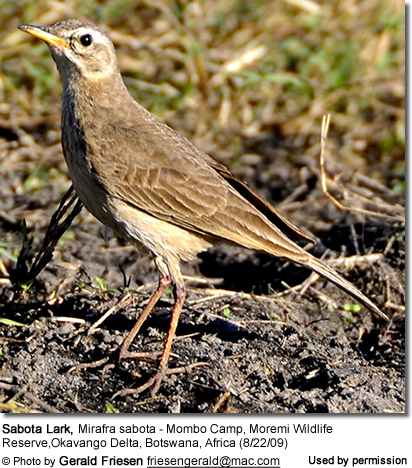 Most lark species have a mostly streaked brown plumage, with some bold black or white markings, and long hind claws. 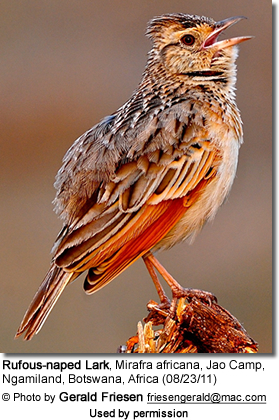 Larks are known for their extravagant and melodious songs mostly given in display flight or when defending their territories. Most species build their nests directly on the ground out of plant material. Some species nest in cup nests, while others build more complicated, partly domed nests. Some desert species nest very low in bushes. The average clutch consists of 2 - 6 eggs that are typically speckled. These eggs are incubated for about 11 - 16 days to hatching. Larks mostly feed on insects and seeds; although the adults of some species exclusively eat seeds, all species feed their young insects for at least the first week after hatching to meet their greater requirement of protein needed for growth and development. Many species use their bills to dig into the ground cover to find food.